Many Thanks to the Millennial Theatre Project and the Akron Civic Theatre! 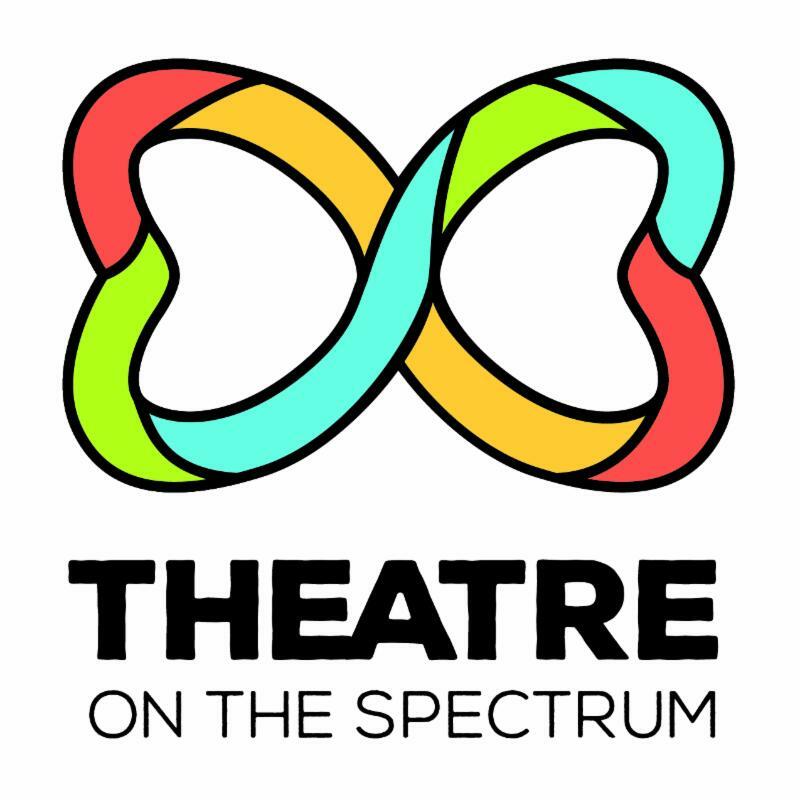 Francine Parr, director of Akron's young and lively new theatre company, visited Theatre on the Spectrum company members on January 19. She shared the challenges and the rewards of starting a new theatre company that is geared toward the area's young adult population. 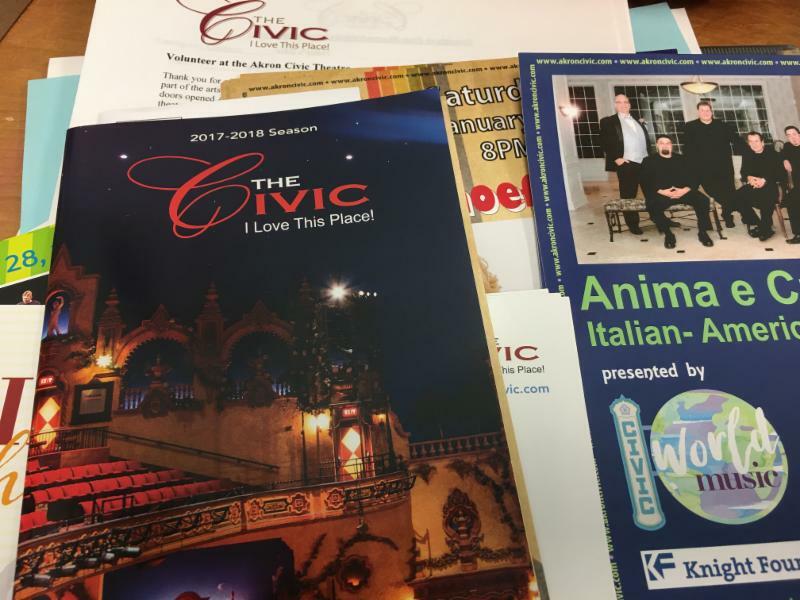 We were all very pleased to hear that the Akron Civic Theatre is accessible for both audiences and performers. Much to our surprise, Francine shared that her company had passed the hat to benefit our organization at the end of their latest performance of Avenue Q! We are so grateful to the Millennial Theatre Project and their audience for their generosity on our behalf. We are going to use their donation to transform our theatre's storefront windows to make our studio more like a theatre! 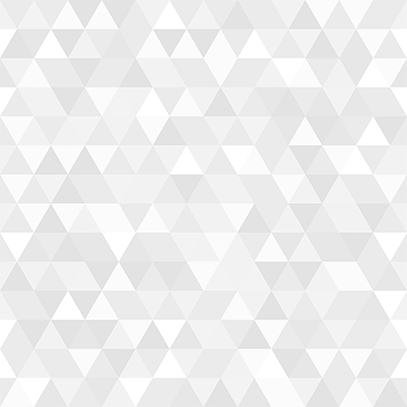 Keep up to date on all the Millennial Theatre Project's upcoming events on their FB page. 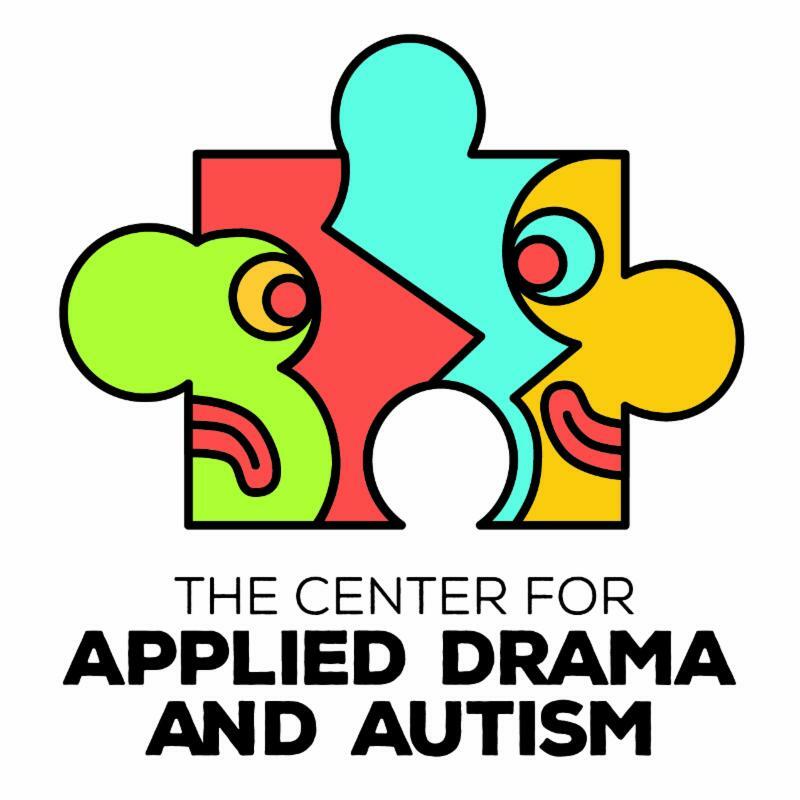 Please consider supporting our efforts with a gift to the Center for Applied Drama & Autism. All donations are tax-deductible. 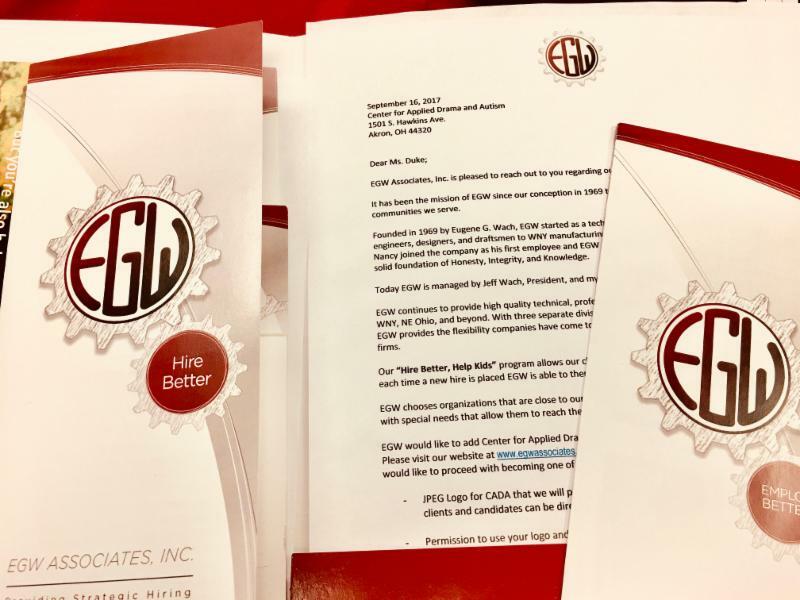 EGW Selects CADA for their "Hire Better, Help Kids Program! EGW, founded in 1969, provides quality technical, professional, and manufacturing employees to companies in WNY, NE Ohio and beyond! With three separate divisions to focus on the unique needs of clients and candidates, EGW provides the flexibility companies have come to expect and appreciate. Their "Hire Better, Help Kids" program allows their clients to hire great candidates through their Direct Hire program. Each time a new hire is placed, EGW is able to then give back a percentage to on of their sponsored non-profits. CADA is honored to be selected for this program. We will use these funds to expand our programming in our new West Akron home. CADA Co-Founder and Managing Director, Wendy Duke attended a Symposium on Inclusive and Accessible Theatre in Lexington KY over the weekend of Feb 2 - 4. There she met with over 60 participants from around the country, from the worlds of educational and professional theatre as well as with those who have dedicated their time and effort to helping make theatre available for people of all abilities. 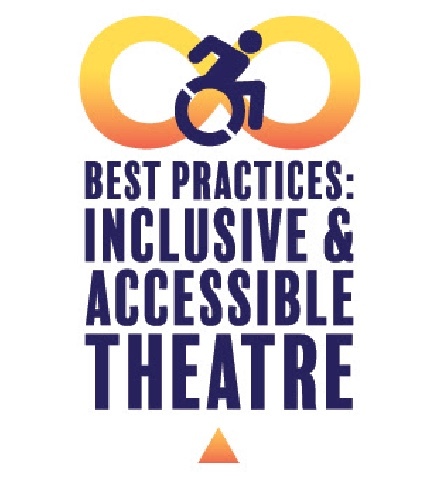 Check out this post on how to make your theatre more accessible. "There's No Business Like Show Business - Valentine's Edition!" We will be performing our cabaret show at our studio on Thursday,February 15 at 1 PM. Please contact us at 234-678-7830 to make a reservation. Seating is limited. We will be passing the hat at the end of the show instead of selling tickets. On Thursday, February 22, you can catch our show at the Wadsworth Goodwill at 1 PM -- in the furniture department! This is a make-up performance from last December. The public is welcome to attend this free show -- and check out the bargains at the Goodwill as well! Contact us at 234-678-7830 to arrange a lunch hour performance at your place or ours! 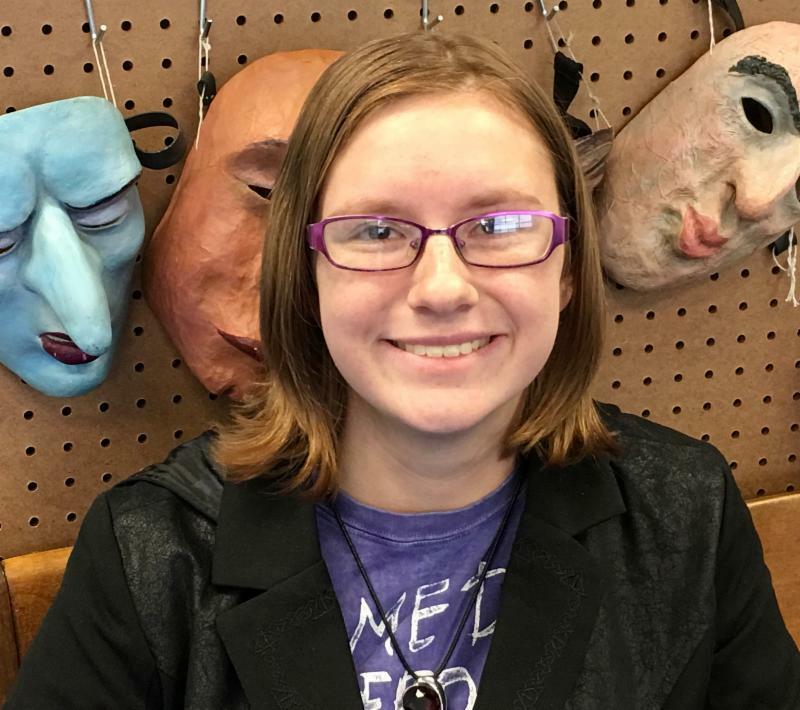 Aubrey is a senior at Tallmadge High School in the career program for theatre arts. She will be attending Ursuline College in the fall to major in art therapy. Aubrey has been assisting in our adult day theatre program three days per week. She says "This is a great experience for me! People don't realize how much theatre can help bring you out of your shell. For me, it was so interesting meeting other people on the autism spectrum. We are all so different!" We'd like to thank Aubrey for her volunteer service and her theatre teacher, Mr David Obney for suggesting CADA as an opportunity for Aubrey to complete her Senior Project. We know that Aubrey will be a super art therapist upon completing her college education!